Literally just an hour or two ago, Travis published this article, titled “Has the Fly-Ball Revolution Begun?” It was his latest piece in what’s unofficially a series, but I can’t help myself but piggyback, because it’s a fascinating subject. A few years back, for the Hardball Times Annual, I wrote about how the information age had handed the advantage to the side of run prevention. Pitchers could better hone in on hitter weaknesses, and defenses could better prepare themselves for expected batted balls. Back then, I wasn’t sure how hitters could fight back. It seemed like theirs would be a losing battle, since their very job is to respond to whatever the pitcher is wanting to do. Now we have Statcast. Even before Statcast, there was HITf/x, but there’s more and more accessible information than ever about exit velocities and launch angles. So the collective hitter response seems to be trying to hit more balls in the air. This is the developing push-back. This is how hitters are making up ground. There’s nothing vague about that. The Pirates want their hitters to knock more liners and flies. Hitters, increasingly, are open to making these changes, because they’re increasingly aware of the supporting evidence. Not that it’s easy to turn grounders into air-balls, of course, but it’s doable for many of these elite-level players. Just so we all know what we’re talking about, here’s a useful table of information from 2016. This shows slugging percentage on batted balls hit at least 90 miles per hour, broken down by launch angle. It’s pretty easy to see the sweet spot. Every single hitter in the major leagues is capable of hitting the baseball 90 – 95mph. When the contact is that good, you want the baseball elevated. Yesterday, I wrote about how Christian Yelich could have Joey Votto upside. Everything is there, except for the lift. Yelich makes consistent and fantastic contact, but too often he’s put the ball on the dirt. Yelich is one hitter who could clearly benefit from hitting more liners and flies, because he’s killed the liners and flies he’s recorded. Thinking about Yelich got me thinking about other possible players. Which other hitters could benefit from putting the ball in the air? Here now is a very simple plot, with Yelich’s data point highlighted. 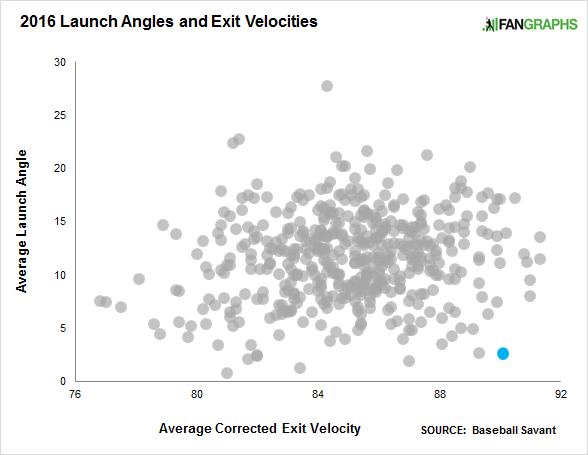 Here you see 2016 launch angles and corrected exit velocities, the latter coming courtesy of Jeff Zimmerman’s research. The Yelich point is certainly out there. In order to put all these points on a scale, I went to tried-and-true z-scores. I calculated exit-velocity z-scores, and then launch-angle z-scores, and I subtracted the latter from the former to generate what we might consider a form of a “leaderboard.” As good proof of concept, the first name to show up is Yelich’s. His exit velocity last year was two standard deviations better than average, but his launch angle was 2.2 standard deviations below average, yielding a difference of 4.2. By this method, more than anyone else, Yelich could benefit from more flies. Freese, who has found success as a ground-ball hitter, said he’d probably delve deeper into contact points and launch angles if he was just starting his career. Along those lines, Hurdle said the Pirates have talked about teaching the concept early on to young hitters. It’s suggested in there that Freese might not want to change anything; he’s established as he is. Perhaps veterans are less likely to alter their approaches. But then, we’ve seen Marlon Byrd and Justin Turner, so you can never really know. We’ll see if Freese attempts to do anything. There is some evidence there. A few of these players, like Mauer and Kendrick, probably aren’t about to make changes. LeMahieu already started. It’s part of what drove his breakout. Pham improved his own launch angle from the season before. Wendle was more of a fly-ball hitter in the minors than in the majors. The same can’t be said of Maxwell, whose thump might be underrated. I can’t just tick off every name near the top of the list, but I’ll note that Domingo Santana shows up. So do Carlos Correa and Gary Sanchez, and as a different sort of player, Billy Butler is up there, too. Butler might’ve had a different career if he ever learned to aim the ball skyward — he’s been more powerful than his career slugging, and it might’ve kept him from having to run so much. Butler represents a possible future for the similar Eric Hosmer if he can’t make his own adjustment. He’s up there, right above Matt Holliday. Just for fun, a name at the far end is Jett Bandy. Bandy was successful last year in terms of putting the ball in the air, but he didn’t actually hit the ball very hard. The same is true of Jose Reyes. Neither player was bad, suggesting maybe even the weaker players should aim up. If you have more power than Billy Burns, there are extra-base hits out there waiting to be collected. This is a very simple and therefore incomplete analysis. It’s more of a starting point, I guess, and it’s important to point out average exit velocity isn’t always correlated to peak exit velocity. Additionally, players can sometimes change their own baseline exit velocities by making certain tweaks. Rougned Odor, for example, just started hitting the ball harder. So did players like Ryon Healy, Sandy Leon, and Sean Rodriguez. You can’t base everything on what’s in the past, and you can’t assume players will make similar contact if they try to do something different. Perhaps some players just can’t handle changing how they’ve hit for so long. Some, though, can. Some have. Christian Yelich is one guy who could clearly stand to continue last year’s progress. He’s not alone, in terms of the potentially helpful adjustment he could make. We hoped you liked reading Which Hitters Could Benefit From Lift? by Jeff Sullivan! I could sure use a lift right now. Too long to walk to the pre-game spread in spring training.